It’s one thing to be dedicated to our daily practice when everything just clicks into place. But when life [sh!t] happens and get complicated, getting to the mat takes a little more work. Without going into details, I’ll just say that I’ve been experiencing more than one of life’s challenges in the past month. Not only has it been tough getting my time to practice, it has also been emotionally challenging to simply BE on my mat. The practice has a way of pointing my emotional compass right to the emotional graveyard of my psyche. How’s that for Dristhi? This week, I’ve managed to shift my schedule so that I arrive at the studio ahead of everyone else. I roll out my mat in a room barely lit by the lights from outside. The peaceful quiet is sweet. With no time to dawdle, I move through my practice with purpose, pausing to find activation of the muscles which refuse to wake early. ALL of Me is required for the practice. And when my time is up, I roll up my mat and get on with it. No complaints. It is what it is. I’ve been practicing Ashtanga Yoga for 5 years now and I’m still struggling to figure out the jump backs and jump throughs. So, the ‘next vinyasa’ (aka my teacher moving on) is yet another struggle with transitions. Like the others, I can fake it but anyone paying any attention to what I’m doing as a yogi can clearly see that I don’t really have it together. And perhaps, none of us really do. Anyone with a serious spiritual yoga practice will attest, it does not matter if you can lift up and jump back, bind in Marichyasana D or stand up from Urdvha Dhanurasana. The asana practice is only one of the eight limbs of the Ashtanga Yoga Method. As for transitions — be it vinyasa, my teacher leaving, or getting to & through menopause — the yoga is in the process of figuring it out. Everything we have been learning on our mats provides us with strength, right at our very core, for the challenges set before us. We are Ashtanga to the Core. And this is why we know that we will be okay. Over the years, I’ve read posts from the various Ashtanga blogs I follow where the ashtangi writes of losing their beloved teacher. Although I could never fully comprehend, the sadness expressed in their words was always palpable. Each of these ashtangis moved forward in their own way. Some moved to a self-practice, others found a new teacher/program. But life-on-the-mat, and off, did go on. Now, it is my turn to face this dilemma. My teacher announced that she will be leaving us in 2 week’s time. My initial attempt to understand her decision went through a curious process of emotions. The morning after I heard the news, I got all choked up and teary-eyed during the morning chant, again while exiting Kapotasana, and once more while my teacher assisted me in Supta Vajrasana. The primary emotion I experienced was one of abandonment, although her decision to move on is nothing of the sort. Still, my deeply-buried hurt of my dad disappearing from our lives after divorcing my mom, in addition to the hurt from similarly painful events, came bubbling up from within. Sadness, anger, hurt… coursed through my being. An excerpt from my asana journal on the final day of a 5 day intensive with David Garrigues at Breathe Together Yoga. In the days leading up to the full moon, I felt uneasy about practicing with the moon full. Years working as a critical care nurse working nightshift on a full moon has reinforced the notion that freaky things happen on a full moon. I guess this is why I have taken the tradition to take rest on “moon days” seriously – especially the full moon. On Monday, the full moon fell on the final day of a 5-day Ashtanga Yoga Intensive with David Garrigues (aka “DG”). I asked my teacher for advice on how to proceed. She advised me to let go of worry and just do it. And so I did. Taking David’s teaching advice from Day 1 to “decide” that “every asana is going to be good”, I rolled out my mat mindfully and with dedicated certainty. It was going to be okay. Better even. It was going to be good. My practice was a culmination of the teachings given to us during the five amazing days of the intensive. My mind was oddly calm in spite of how tired I was from the previous days of rigorous asana, pranayama, theory and chanting. As if harnessing the moon, I found a nice balance point at the edge of exhaustion and exhilaration. Everyone around me seemed to be doing the same. Of all the asanas in my practice, Kapotasana was the one which seemed highlighted during this intensive. Each day, I came to it with the plan to take it on once and then move on. 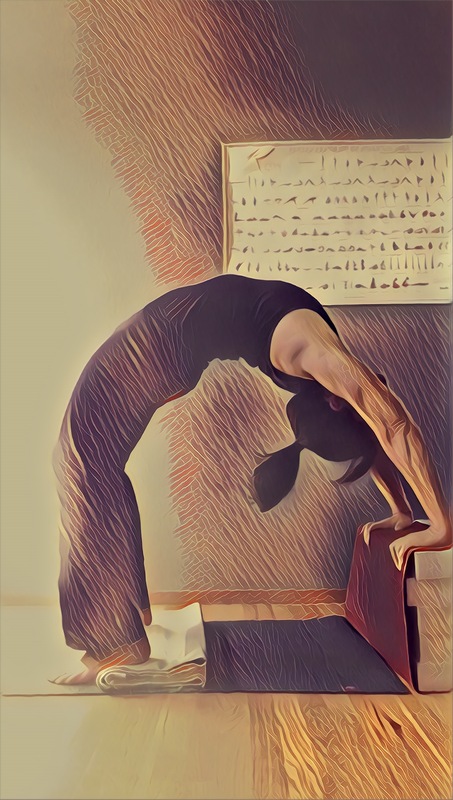 This was not my usual routine; more often than not, I take a few false starts (reaching up but not going back) before I am able to fully access the power of my legs and openness in my back to move towards the mat behind me. Each day, in this intensive, it seemed to come a little easier or deeper than the day before. I had no idea how it actually looked but it felt like I was making progress. So when I heard Erika, my teacher, telling me to hang on so she could get photos of me moving through the positions of the pose, I didn’t mind holding it for a few breaths longer. I did my best to get my fingers to my toes, as I’d been able to do the previous few days. It didn’t matter if this magic was due to the heat of the room, or simply because DG was here. We are taught to practice non-attachment. Right? If I wasn’t able to reproduce it past today, it would be lovely to have a photo of what is possible. Feeling like I’d taken my Kapotasana as deeply as possible, I was starting to come out of the pose when I heard DG say, “Hang on, Julie.” I waited as he made his way over. A moment later, he was showing me how much deeper in the pose was possible – for me even. I emerged whole, grateful and high on an adrenaline rush (or maybe I was just in awe of possibility). My practice went on from Kapotasana even more open to possibility. By the time I rolled up my mat, I was enjoying the feeling of feeling completely emptied out and filled up – simultaneously. What’s more, I emerged from the Intensive clear, complete, and uninjured. While I have no intention to ignore the tradition of resting on moon days, I am glad that I made an exception for this one. I’ve learned so much in this intensive and look forward to putting it into practice. Every day. Every pose. Using each repetition within the set sequence to create a meditation that takes me within. There’s so much there…. Earlier this week, I was asked “Why do you like Ashtanga Yoga?” The question was not an inquiry on my love of yoga but rather my choice in style or “method” as noted by the Ashtanga community. My reply was a quick, not fully well-thought out answer. I simply said because I can practice at my own pace and easily attend to injuries. But that’s only the tip of the iceberg. When I first began “doing” yoga, I gravitated towards the heated vinyasa classes. I was there for a work out and sought out the teachers that would give me the biggest arse kicking I could get. My first teacher was no dummy. She gave us what we came for but, as we became drenched in sweat, she continually doused us with inquiries of a spiritual and emotional nature. By the time we settled into savasana, we were thoroughly cooked (physically, emotionally, and spiritually). It was great. That same teacher introduced me to Ashtanga. 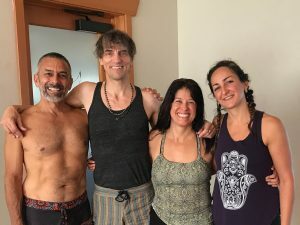 There was a group of about twenty who took her “Introduction to Ashtanga class” in preparation for a full-blown mysore style program to start at the studio. She planted the seeds and they immediately began taking root. I did a self practice at home, trying to be worthy of entering the program. I couldn’t jump through or jump back, and I wasn’t at all certain about the rest of the practice either. Notice my Marichyasana C has a nice bind but I’m doing it all wrong; the spine is supposed to rotate in the other direction with the other arm doing the wrapping. Although I still came for the weekly vinyasa classes, I somehow knew that there was something deeper for me in the Ashtanga practice. It was just a sense; I had nothing tangible to back it up. And still, I insisted it was true well before I braved the Mysore Room. My boyfriend thought I was crazy, pointing out the numerous forward folds in the practice and citing my struggles with chronic back pain. By the time I braved the room, I hadn’t progressed any further in gaining the knowledge that I thought was needed to be a good mysore student. My teacher, Erika, took what I thought I knew, and customized it for me. Basically, she modified the way I practiced even the simplest of asanas so that my practice was more therapeutic for my back. For example, I placed two blocks at the top of my mat and placed my hands on the blocks when I did the forward folds in the sun salutations. I used a block in many of the standing poses, such as trikonasana, as well. This went against my tendency to power through the practice and I initially felt like I was being forced to be a beginner again (which I was — but, after surviving those arse-kicking vinyasa classes, somehow felt that I was more intermediate level). The result was humbling and definitely revealed my lifelong fear of being “not good enough”. It was quite a mind game and would definitely not be the last. The funny thing was that these modifications, which seemed to make the pose easy, actually forced me to engage my muscles in places where I had simply been bypassing with a misaligned, athlete-minded way of doing yoga. I began learning about my body in a whole new way. On a physical level, I learned that although my spine has odd curves due to scoliosis I can still move toward equanimity by learning to engage the needed muscles and relax the muscles that are not needed. There is a difference between discomfort and pain. There is “the truth” and there are the “stories” you have bought into throughout your life. The processing of breaking lifelong patterns is HARD. Although the physical practice is the same set of asanas, each day the practice unfolds differently. My practice is not “good” or “bad”; it just is. It is physical but it is NOT a workout. As Mojdeh, my Sunday teacher often tells her students in the all-comers Led Primary, “If you are here for a workout, you are in the wrong place. You can go to 24 hour Fitness or another gym for that.” Those of us who do the Ashtanga practice every day, laugh in the back of the room when she says that. We also laugh when she says that the Ashtanga practice is “boring.” We know better; it is far from boring. It’s hard to explain. I honestly think that you just have to experience it to understand. Any way, this just skims the surface of the “Why” I love the Ashtanga Yoga Method.